At a recent meetup, Kim Ho and Alan Caudill of Salesforce.com described how they used Rundeck as part of a custom operations automation solution. One of their initial use cases for Rundeck was around improving the repeatability and reliability of system provisioning. In the past, their operators often had to run through complex run lists where there could be 12 or more steps, each with lots of sub-steps. They needed a way to remove the manual process and allow operators to push a button and get a fully provisioned host that is consistent and correct every time. Beyond that use case, the team had a variety of situations where they needed to automate processes across the various tools used in their environments. Those tools needed to be orchestrated and they needed a way to create repeatable and reusable jobs that can be shared across the organization. To do this at scale (tens of thousands of nodes; thousands of jobs), the Salesforce.com team took a toolchain approach that features Rundeck, SaltStack, and a custom internal tool called Kingpin. The solution's code name? 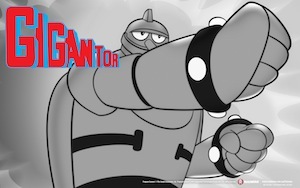 Gigantor. Below are two videos of Kim's and Alan's public presentations that describe in more depth the use of Rundeck within their Gigantor solution. Here at the Rundeck project, we think it's a great example of the flexibility and utility of Rundeck. 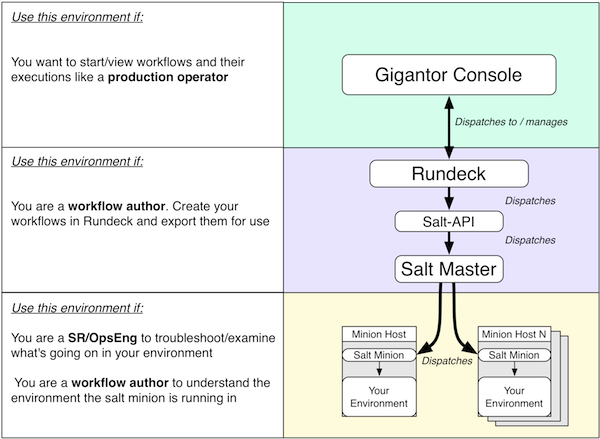 You can use Rundeck as a primary interface for operations or you can bake it into your own solution. It's all up to what your requirements are. Big thanks to the entire Salesforce team for their support and contributions to the Rundeck project!